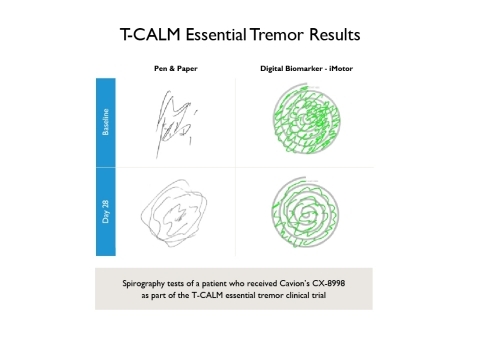 HONG KONG--(BUSINESS WIRE)--Cavion, Inc., a leading clinical stage biotechnology company committed to developing novel therapeutics for people with neurological diseases, today announced promising results of the T-CALM Phase 2 clinical trial of its first-in-class T-type calcium channel modulator CX-8998 in essential tremor. The company plans to present results from this proof-of-concept study as a late-breaking poster on Monday, October 8 at the International Congress of Parkinson’s Disease and Movement Disorders® in Hong Kong. Cavion announces results of Phase 2 study of its first-in-class T-Type calcium channel modulator CX-8998 in essential tremor at MDS 2018 in Hong Kong.